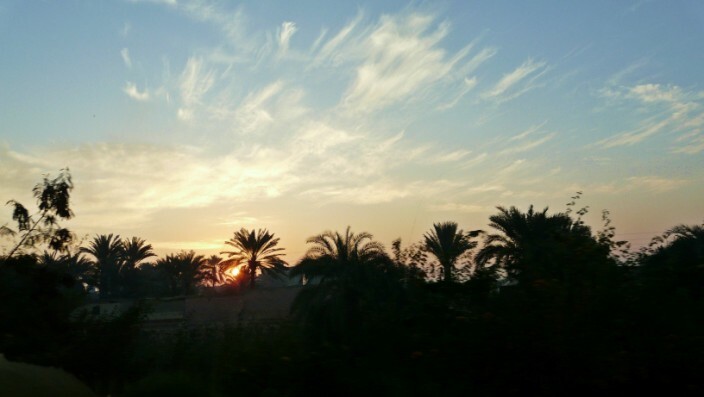 We’re off to Egypt once more for the third in our continuing series of guest posts by Marilyn Kamcheff on her Egyptian adventures. 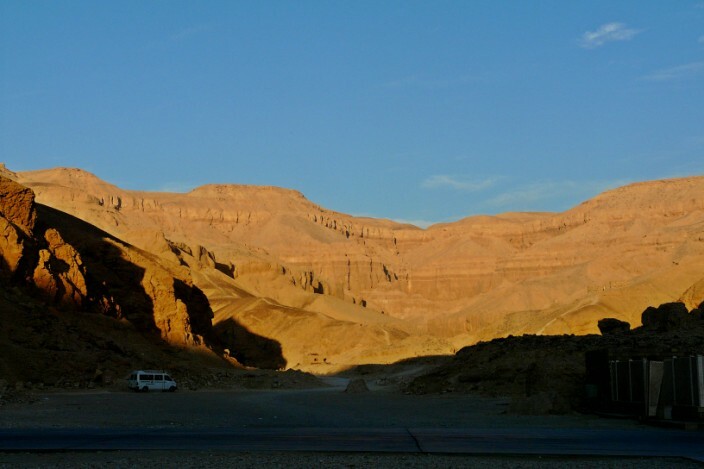 January 25th we had an early (6:15 a.m.) departure for a bus ride to the Valley of the Kings. 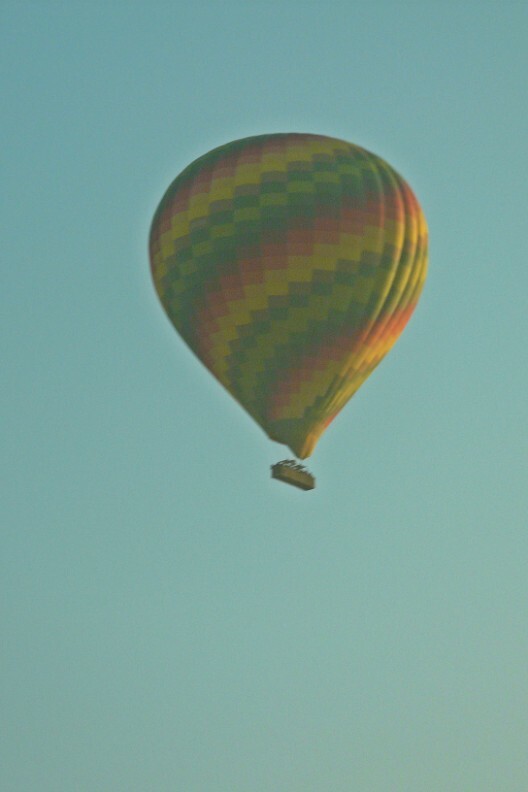 On the 90 minute ride to the remote burial site we witnessed a beautiful sunrise and some hot air balloons. Once at the Valley of the Kings we were told that we could not take our cameras through the entry gate. That was very disappointing, so I snapped a couple of pictures looking at the hillside. The price of entry allowed us to visit three separate tombs. We were told that if we wanted to visit King Tut’s tomb, we needed to buy an extra ticket for 100 LE ($20). As we entered the Ramses II site, there was a feeling of intense spirituality as we passed through a large tunnel. The floor was a wooden ramp with crossbars of wood on it. The walls and ceilings were covered in hieroglyphics, remnants of bright paint clinging to the carvings done thousands of years ago. Each line, curve, animal, person, was chiseled to the same depth. 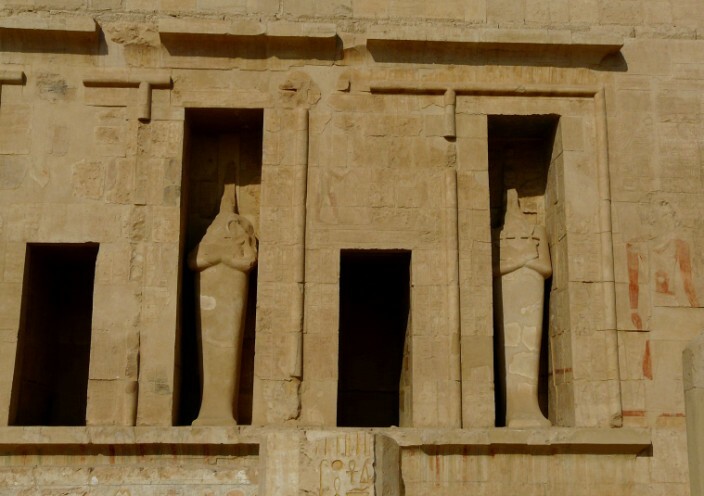 We walked for several hundred yards where the hall opened up to a large chamber that had a huge red granite sarcophagus with a stone carving of Ramses lying on top. The oblong box was well over 10 feet high and a chair was needed to see the king resting in effigy for eternity. Everywhere we visited there were throngs of people and long lines which moved at a measured pace that allowed many people to enter and exit the tombs. 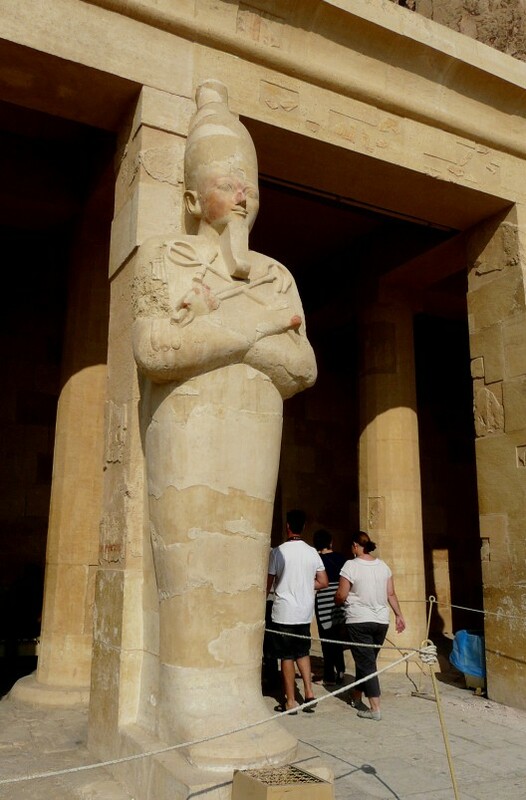 Mohammed I, our Egyptologist, was a huge fan of Ramses II. He was the “great” king of Egypt, having ruled for 67 years, had many wives and concubines, and hundreds of children. He was, like all pharaohs, a warrior king. One of the fascinating facts about the ancients was that whenever a new pharaoh came to rule, they often “wrote” over the memories on the pyramids of their predecessor. Another tidbit is that they only recorded their victories, never, ever their losses in battle. And yet another fact is that the Egyptian warriors were always retrieved from the battlefield and brought back to Egypt for burial. Our second tomb was of Ramses IV, a lesser known king, but he had been buried in the traditional style with lots of hieroglyphics. 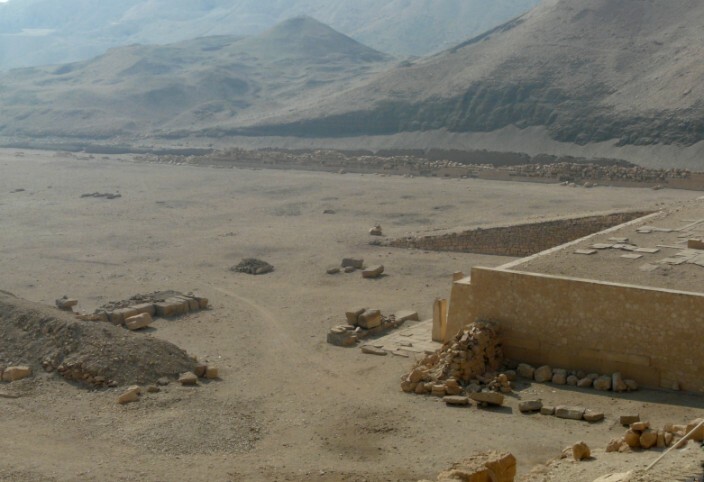 Sadly, this remote valley, chosen to protect the tombs and the daily necessities for the afterlife was discovered hundreds, if not thousands, of years ago and many of the tombs had been robbed and the artifacts sold. After the tour of the Ramses IV tomb we were allowed to choose the third tomb of our choice. We went directly to the King Tut tomb to ensure that we saw the famous tomb discovered by Howard Carter nearly 90 years ago. 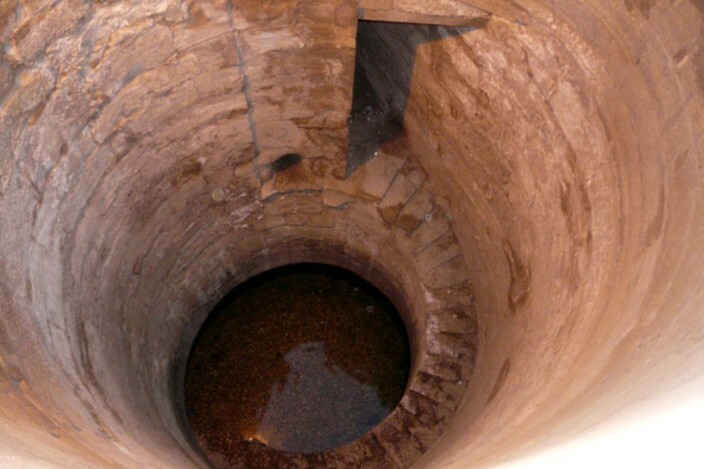 The descent was down very steep wooden steps that ended on a narrow passage way leading to a small square chamber. On either side of the chamber was a larger room. On the right hand side was the granite sarcophagus that had held the inner golden funeral container with King Tut’s body. Opposite of this room was a stone catafalque with a glass coffin on top. The mummy inside the temperature controlled box is reportedly King Tut. The wrinkled, prune like body is small, 4 to 4-1/2 feet in length, of an aged, dark brown leather color. The third tomb we opted to go in on our general admission ticket was about two blocks up a slight hill. It was by far the most incredible of the three tombs. This tomb was numbered KV14, discovered in 1907. 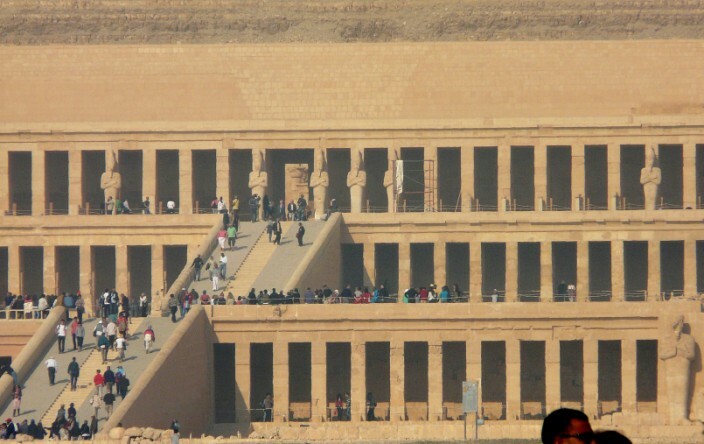 It is the largest tomb in the Valley of the Kings. 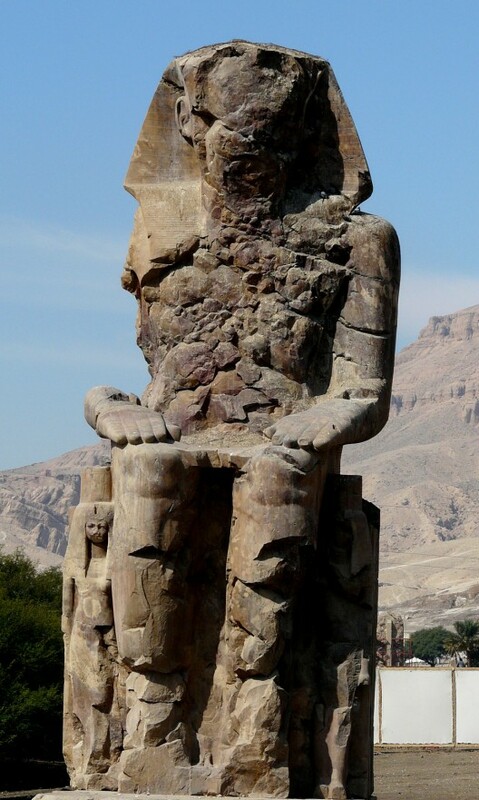 King Tawosert was the father of Ramses III. The first passage is decorated with figures of deities, which leads into a second passage supported by square pillars. The entire area is decorated with scenes from the Book of the Dead. Along the hallway are rooms of varying sizes, called antechambers, festooned with various paintings of deities. 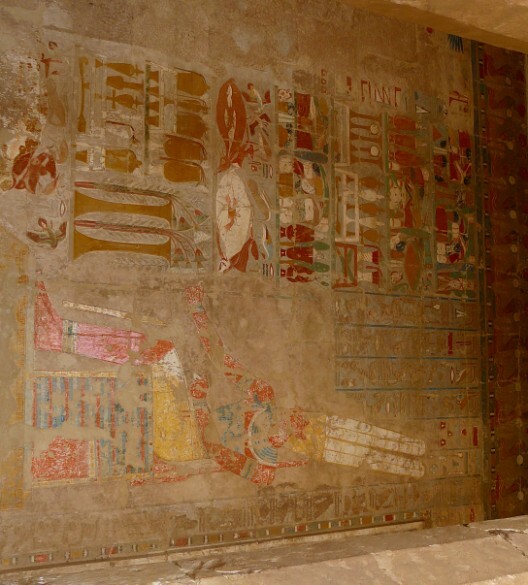 There were scenes depicting mummification painted on the walls. After a block or more walking along the wooden covered floor (installed to keep dust down and preserve the tombs) we came to the burial chamber of Tawosert, decorated with scenes from the Book of Caverns and from the Book of Gates. Continuing on, we learned that another king is buried in this mountain mausoleum, King Setnakht. 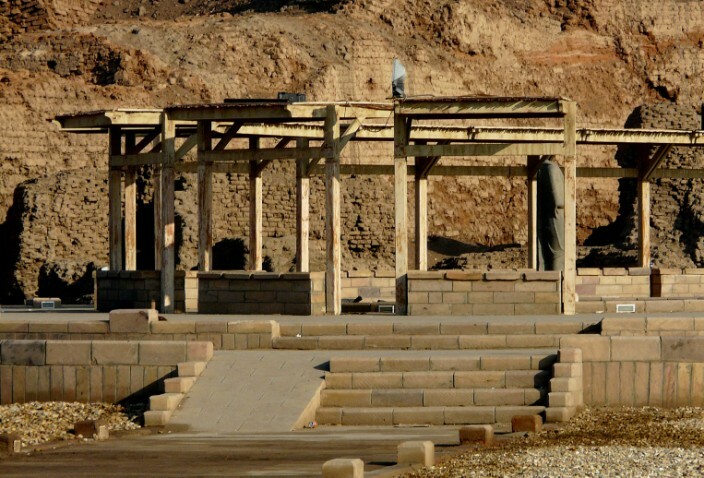 As was common, a ruling king often “took over” a dead kings burial site. His burial chamber is decorated with astronomical scenes on the ceiling and scenes from the Book of Gates on the walls. Overall, this burial site is several blocks long, chiseled from a granite mountain. At the very end of the long passage way is the final burial chamber with a granite sarcophagus of Setnakht. The paintings in this tomb were vivid and well preserved, transporting my mind back in time to the ancient burial ritual reserved only for pharaohs. As we gathered at the shuttle site for transportation back down the hill, about one mile to the entrance, I opted to jog back. I arrived moments after the majority of our tour exited the shuttle bus. Exiting at Valley of the Kings was the typical narrow, stall lined street, where vendors tried to sell their wares. We had been warned to not make eye contact, and to never accept a free gift. I found this portion of our trip to be both annoying and frustrating. Every site was crawling with vendors hawking their wares. They are difficult to ignore, and it goes against my grain to be rude, but essentially being rude was the only way to get through the throngs. As we exited to get to our bus, Janet and I put our heads down and charged through the market place, hell bent on getting through without buying anything “for one American dollar.” We stepped out of the market into the sunshine and kept walking quickly forward. A man tapped Janet on the shoulder and said “Ma-dam” several times. She ignored him and kept walking. I was about 10 steps ahead of her. I heard her say to him, “Don’t touch me.” Finally, the man stepped in front of her to stop her, because we had shot past our bus and he was our tourist policeman, taking care of us. We were kidded that we had really learned how to ignore the vendors. 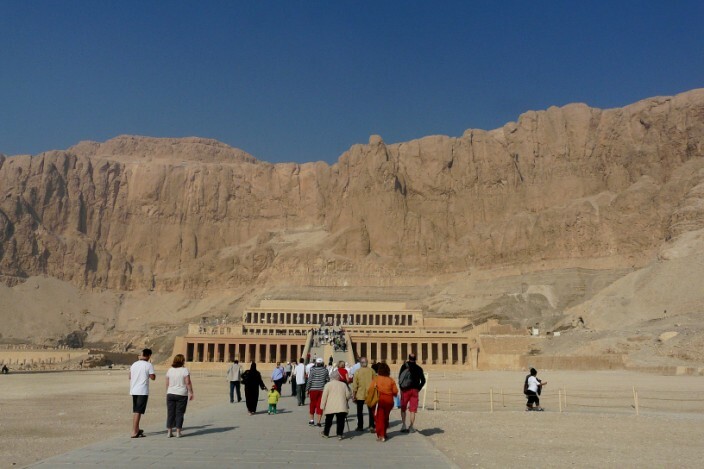 We boarded our lovely bus and were whisked away to visit Queen Hatshepsut’s temple at El Deir El Bahary. She was the only female pharaoh. Bus parking was three or four blocks away and once we reached the temple there were many stairs to climb, a landing, and more stairs. 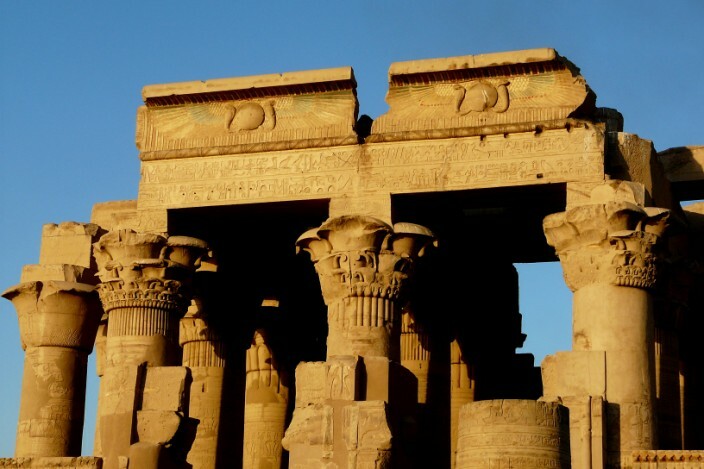 On the way back to the ship, we stopped beside the road to look at two deteriorated stone giants that were all that remained of an ancient temple. Our next stop was at an alabaster factory where there was a young man in traditional galabaya who was very animated. He talked and joked and broke into silly songs. The three workmen that were carving alabaster would chime in at his jokes, or to support his singing. He picked up an Ankara from a box beside one of the carvers and handed it to me, saying “you are now my wife.” He then handed a scarab to another lady in our group and announced she was also his wife. He then joked he could have many, many wives, just like the pharaohs of old. While going through his well-rehearsed comic routine he also told us that there are three colors of alabaster, white, green and brown, and how it was carved by hand at his shop. He said that you can always tell if a piece is done by a craftsman, or by a machine. Crafted alabaster objects, especially vases, are translucent. A little girl, about 3 years old, stood in front of our group. In her left hand she clutched some coins. She tried to make eye contact with people in the crowd and if she did she would put her right hand out, palm up, for a coin. Very sad. After the “pep” talk, aka comedy routine, we were invited into the showroom where there were many beautiful pieces of alabaster carved into various souvenirs. Although the objects for sale were unique and well made, I felt they were higher priced than I wanted to spend, not to mention they were fairly heavy and a deterrent to packing them in a suitcase with a weight limit of 44 lbs. Incense was burning in several areas and the smell was so thick that we quickly exited and went back outside to moderately clean air. 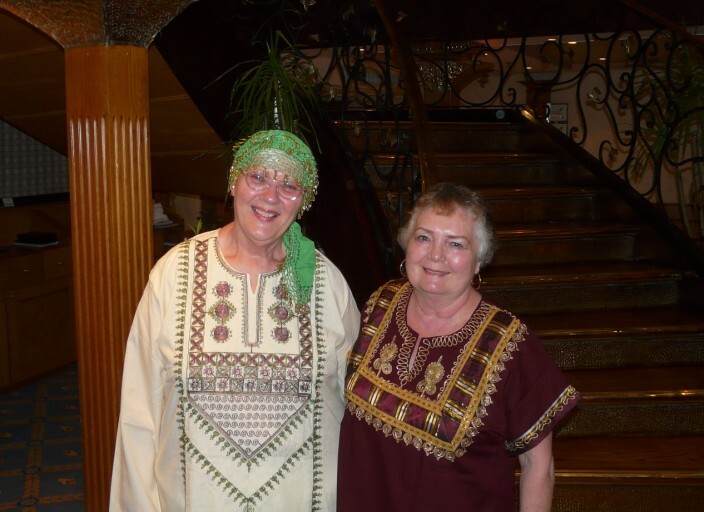 Once back on board ship, we had a buffet lunch and set sail for Edfu, arriving around midnight. About one a.m. there were voices outside our cabin window, obviously coming from the water. My first thought was River Pirates, and I hoped that no one was foolish enough to open their windows and allow entry. I later learned they were vendors, selling their wares. Our Alki tour guide, Tyson, said he haggled at least an hour with one of the vendors, but felt it was worth it for the beautiful rug he purchased. 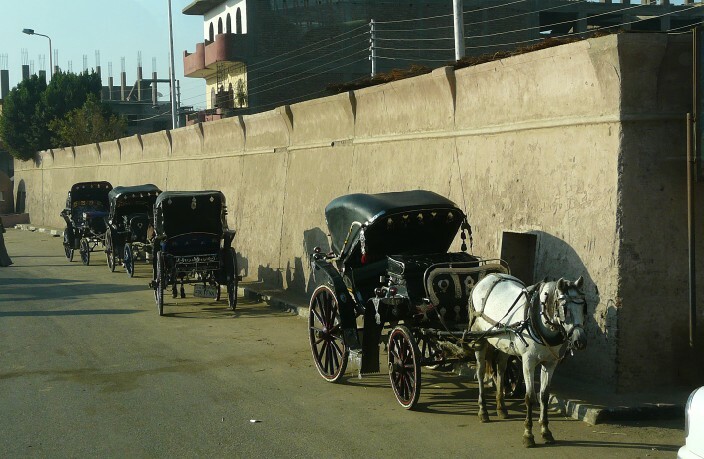 Tourist taxis were common everywhere, and the horses looked under nourished. 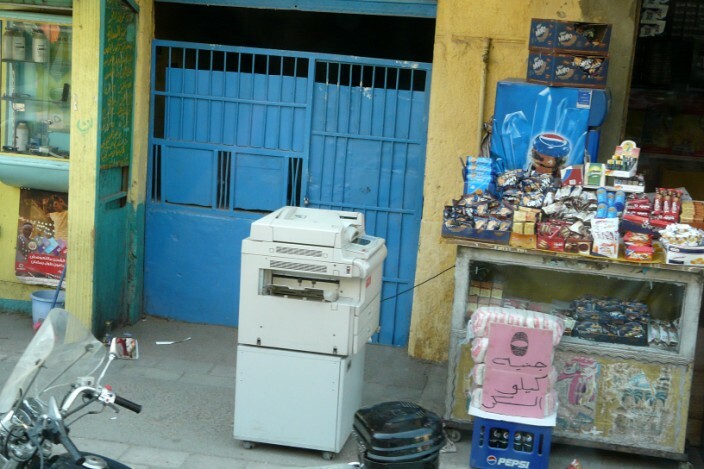 We laughed when we saw a Xerox machine on the street next to this candy shop. 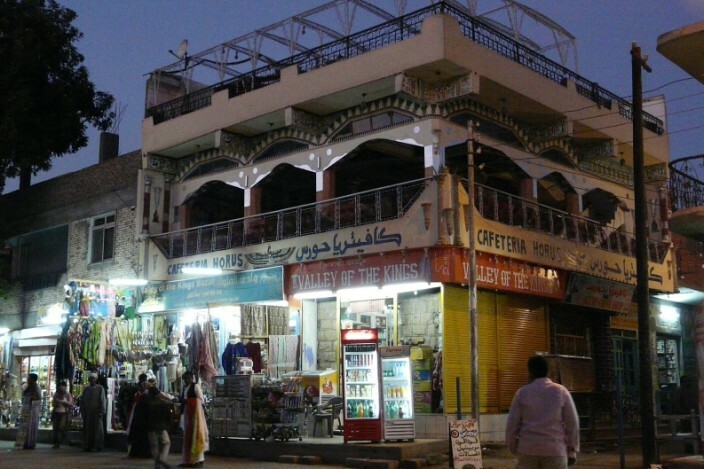 Open air shops were common with merchandise overflowing onto the sidewalk. Often the clothes were faded from the sun. One or two places we saw pharmacy, dentist and doctor signs on well worn doors with faded paint, scratches and gouges, or sometimes iron bars. The windows were dusty and had drawn shades, a very unappealing entrance for a medical procedure. It was obvious from the gap-tooth smiles we saw that preventive dentistry was not a common goal. 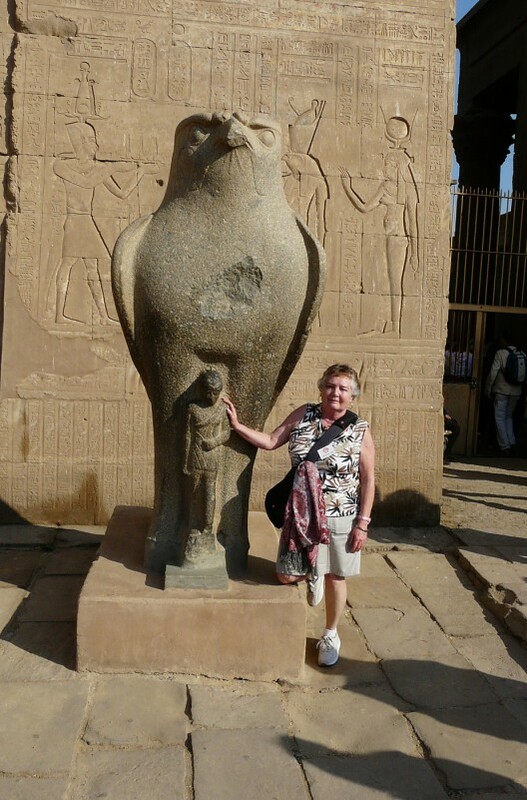 Edfu, like every site we visited, was packed with tourists from every nation. I was constantly amazed how so many people could be funneled through these ruins, hear their guides lecture and be able to see everything there was to see. This structure appeared to be an amphitheater of sorts. 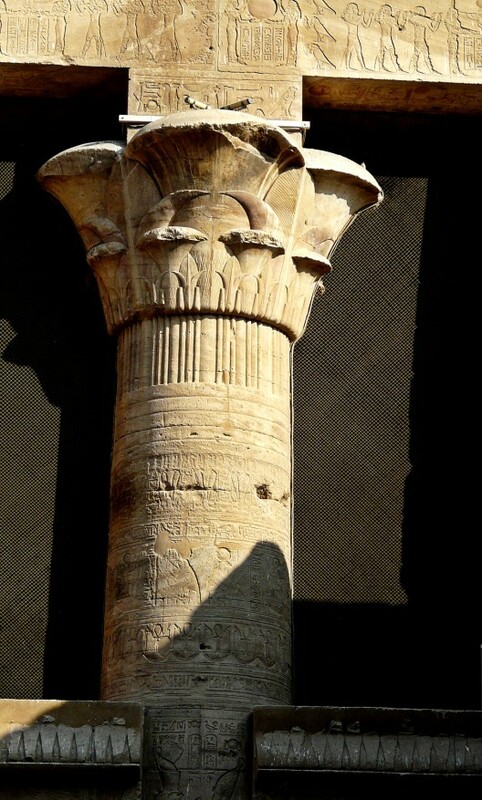 Note the carvings above the column and also on the column. The falcon was a popular spot for pictures and we had to wait several minutes in line before getting ours taken. 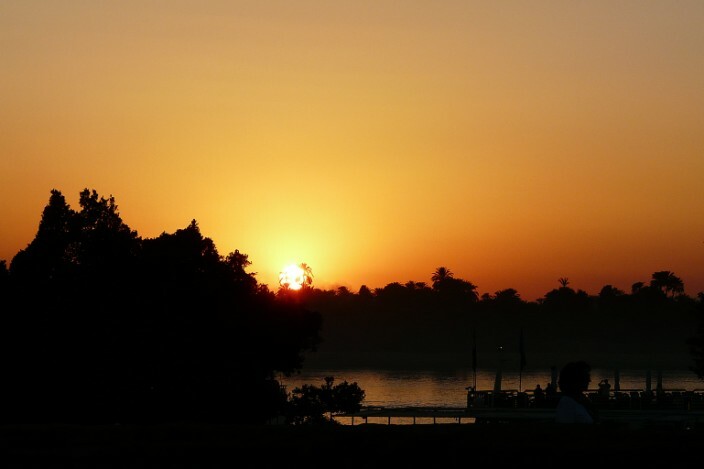 After seeing Edfu, we set sail for Kom Ombo, the crocodile-headed God of fertility and creator of the world. Once docked, we walked about three or four blocks along the wharf to the entrance of the temple. Unlike other sites we visited, this one had a well on it. Note the entrance door and spiral staircase. 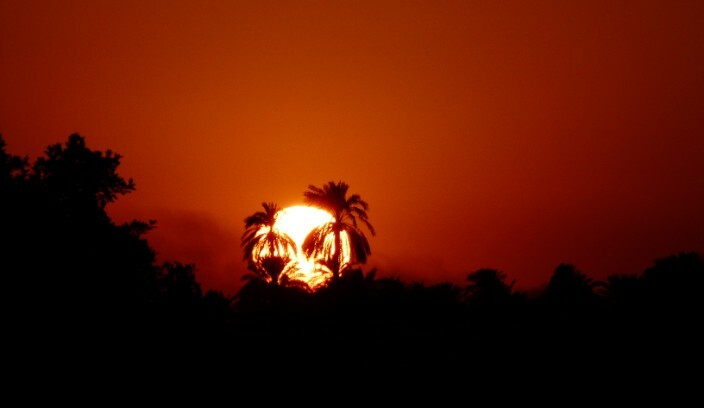 Sunset was a truly an “African” sight.